A book edited by the Editorial Director of this business between 2012-2013. When starting to work on renewable energies in 2005, this field was extremely promising, and I was so energized. Now looking back the projects that I have accomplished: liquefaction, gasification, pyrolysis, biological conversion of cellulosic biomass, algal technology, anaerobic digestion, etc., the more I learn, the more certain I am that I know nothing. This field is still promising, though I have seen that many companies fell down, but more companies are rising, and the governments are ardently supporting. 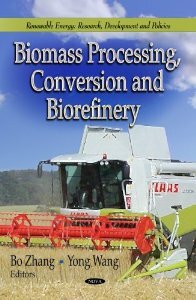 In 2012, I invited the experts from all over the world to contribute to the Biomass Processing, Conversion and Biorefinery. As the first edition, we are only able to cover limited topics. I hope that we will be able to cover more comprehensive topics in the second edition, which will be done in 4 or 5 years.